Newtonians (also known as catoptrics) usually use a concave parabolic primary mirror to collect and focus incoming light onto a flat secondary (diagonal) mirror that in turn reflects the image out of an opening at the side of the main tube and into the eyepiece. A bit like the picture above. Most Newtonian Telescopes have been supplied on equatorial mounts. The last few years has seen a new commercial telescope available on the market - the Dobsonian. A Dobsonian is a simple altazimuth mounted Newtonian telescope which is excellent for beginners and in large sizes is an economical "Light Bucket". Simple construction means they are easy to look after and a lot of aperture can be carted around, 200mm to 250mm Dob's can be slung across the back seat of a car and transported anywhere. If you wish for the ultimate planetary telescope, and also a scope which is virtually maintenance free then look no further than a refractor. 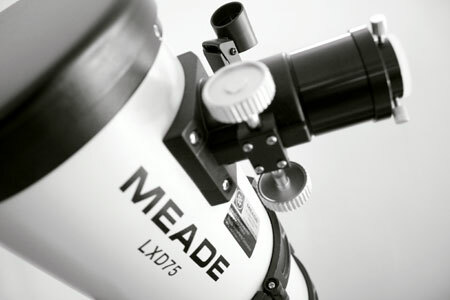 At the moment refractors are in vogue due to their portability, image quality and robustness. Dobsonian's have their place if you know the sky, love deep sky object's and are just happy to roam the stars. The newest designs are even more portable, and even have adapters to fit small digital cameras.